devotes most of its volume (and computational power) to processing its various sensory inputs and initiating appropriate — and coordinated — motor outputs. gray matter = masses of the cell bodies and dendrites — each covered with synapses. In the spinal cord, the white matter is at the surface, the gray matter inside. In the brain of mammals, this pattern is reversed. However, the brains of "lower" vertebrates like fishes and amphibians have their white matter on the outside of their brain as well as their spinal cord. The region between the arachnoid and pia mater is filled with cerebrospinal fluid (CSF). The cells of the central nervous system are bathed in a fluid, called cerebrospinal fluid (CSF), that differs from that serving as the interstitial fluid (ISF) of the cells in the rest of the body. Cerebrospinal fluid leaves the capillaries in the choroid plexus of the brain. through an interconnected system of four ventricles in the brain. CSF returns to the blood through lymphatic vessels draining the brain. In mice, the flow of CSF increases by 60% when they are asleep. Perhaps one function of sleep is to provide the brain a way of removing potentially toxic metabolites accumulated during waking hours. all the sensory axons pass into the dorsal root ganglion where their cell bodies are located and then on into the spinal cord itself. all the motor axons pass into the ventral roots before uniting with the sensory axons to form the mixed nerves. It connects a large part of the peripheral nervous system to the brain. Information (nerve impulses) reaching the spinal cord through sensory neurons are transmitted up into the brain. Signals arising in the motor areas of the brain travel back down the cord and leave in the motor neurons. The spinal cord also acts as a minor coordinating center responsible for some simple reflexes like the withdrawal reflex. The interneurons carrying impulses to and from specific receptors and effectors are grouped together in spinal tracts. Impulses reaching the spinal cord from the left side of the body eventually pass over to tracts running up to the right side of the brain and vice versa. In some cases this crossing over occurs as soon as the impulses enter the cord. In other cases, it does not take place until the tracts enter the brain itself. hindbrain (rhombencephalon — dark color) The human brain is shown from behind so that the cerebellum can be seen. Some, e.g. number III that controls eyeball muscles, contain motor axons only. The neurons controlling breathing have mu (µ) receptors, the receptors to which opioids, like heroin, bind. This accounts for the suppressive effect of opiates on breathing. [Discussion] Destruction of the medulla causes instant death. The pons seems to serve as a relay station carrying signals from various parts of the cerebral cortex to the cerebellum. Nerve impulses coming from the eyes, ears, and touch receptors are sent on the cerebellum. The pons also participates in the reflexes that regulate breathing. The reticular formation is a region running through the middle of the hindbrain (and on into the midbrain). It receives sensory input (e.g., sound) from higher in the brain and passes these back up to the thalamus. The reticular formation is involved in sleep, arousal (and vomiting). 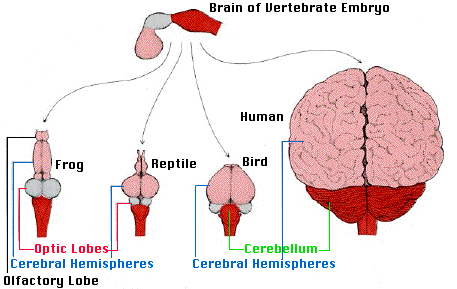 The cerebellum consists of two deeply-convoluted hemispheres. Although it represents only 10% of the weight of the brain, it contains some 80% of all the neurons in the central nervous system. Its most clearly-understood function is to coordinate body movements. People with damage to their cerebellum are able to perceive the world as before and to contract their muscles, but their motions are jerky and uncoordinated. So the cerebellum appears to be a center for learning motor skills (implicit memory). Laboratory studies have demonstrated both long-term potentiation (LTP) and long-term depression (LTD) in the cerebellum. the reticular formation: collects input from higher brain centers and passes it on to motor neurons. the substantia nigra: helps "smooth" out body movements; damage to the substantia nigra causes Parkinson's disease. whose projections synapse deep within the forebrain. The VTA seems to be involved in pleasure: nicotine, amphetamines and cocaine bind to and activate its dopamine-releasing neurons and this may account — at least in part (see below)— for their addictive qualities. Link to discussion of how various psychoactive chemicals act on synapses within the central nervous system. The midbrain along with the medulla and pons are often referred to as the "brainstem". a pair of large cerebral hemispheres, called the telencephalon. Because of crossing over of the spinal tracts, the left hemisphere of the forebrain deals with the right side of the body and vice versa. a group of structures located deep within the cerebrum, that make up the diencephalon. All sensory input (except for olfaction) passes through these paired structures on the way up to the somatic-sensory regions of the cerebral cortex and then returns to them from there. signals from the cerebellum pass through them on the way to the motor areas of the cerebral cortex. Lateral geniculate nucleus (LGN). All signals entering the brain from each optic nerve enter a LGN and undergo some processing before moving on the various visual areas of the cerebral cortex. The seat of the autonomic nervous system. Damage to the hypothalamus is quickly fatal as the normal homeostasis of body temperature, blood chemistry, etc. goes out of control. The source of 8 hormones, two of which pass into the posterior lobe of the pituitary gland. Link to a discussion of the hormones of the hypothalamus. Posterior lobe of the pituitary. from the hypothalamus and releases them into the blood. Link to discussion of the pituitary. an olfactory bulb; they receive input from the olfactory epithelia. Link to discussion of olfaction. The pleasurable (and addictive) effects of amphetamines, cocaine, and perhaps other psychoactive drugs seem to depend on their producing increasing levels of dopamine at the synapses in the nucleus accumbens (as well as the VTA). hippocampus. It is essential for the formation of long-term memories. The amygdala appears to be a center of emotions (e.g., fear). It sends signals to the hypothalamus and medulla which can activate the flight or fight response of the autonomic nervous system. oxytocin whose activation lessens the signs of stress. The amygdala receives a rich supply of signals from the olfactory system, and this may account for the powerful effect that odor has on emotions (and evoking memories). It is estimated that the human brain contains some 86 billion (8.6 x 1010) neurons averaging 10,000 synapses on each; that is, almost 1015 connections. How to unravel the workings of such a complex system? Several methods have been useful. Microscopic examination with the aid of selective stains has revealed many of the physical connections created by axons in the brain. This device measures electrical activity (brain "waves") that can be detected at the surface of the scalp. It can distinguish between, for example, sleep and excitement. It is also useful in diagnosing brain disorders such as a tendency to epileptic seizures. have provided important insights into the functions of various parts of the brain. Battlefield injury to the left temporal lobe of the cerebrum interferes with speech. 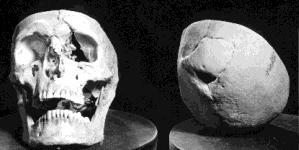 The photograph (courtesy of the Warren Anatomical Museum, Harvard University Medical School) shows Gage's skull where the bar entered (left) and exited (right) in the accident (which occurred 12 years before he died of natural causes in 1861). There are no pain receptors on the surface of the brain, and some humans undergoing brain surgery have volunteered to have their exposed brain stimulated with electrodes during surgery. When not under general anesthesia, they can even report their sensations to the experimenter. Experiments of this sort have revealed a band of cortex running parallel to and just in front of the fissure of Rolando that controls the contraction of skeletal muscles. Stimulation of tiny spots within this motor area causes contraction of the muscles. The area of motor cortex controlling a body part is not proportional to the size of that part but is proportional to the number of motor neurons running to it. The more motor neurons that activate a structure, the more precisely it can be controlled. Thus the areas of the motor cortex controlling the hands and lips are much larger than those controlling the muscles of the torso and legs. A similar region is located in a parallel band of cortex just behind the fissure of Rolando. This region is concerned with sensation from the various parts of the body. When spots in this sensory area are stimulated, the patient reports sensations in a specific area of the body. A map can be made based on these reports. When portions of the occipital lobe are stimulated electrically, the patient reports light. However, this region is also needed for associations to be made with what is seen. Damage to regions in the occipital lobe results in the person's being perfectly able to see objects but incapable of recognizing them. The centers of hearing — and understanding what is heard — are located in the temporal lobes. This is an imaging technique that uses a series of X-ray exposures taken from different angles. Computer software can integrate these to produce a three-dimensional picture of the brain (or other body region). CT scanning is routinely used to quickly diagnose strokes. This imaging technique requires that the subject be injected with a radioisotope that emits positrons. water labeled with oxygen-15 (H215O) is used to measure changes in blood flow (which increases in parts of the brain that are active). The short half-life of 15O (2 minutes) makes it safe to use. deoxyglucose labeled with fluorine-18. The brain has a voracious appetite for glucose (although representing only ~2% of our body weight, the brain receives ~15% of the blood pumped by the heart and consumes ~20% of the energy produced by cellular respiration when we are at rest). When supplied with deoxyglucose, the cells are tricked into taking in this related molecule and phosphorylating it in the first step of glycolysis. But no further processing occurs so it accumulates in the cell. By coupling a short-lived radioactive isotope like 18F to the deoxyglucose and using a PET scanner, it is possible to visualize active regions of the brain. The images above (courtesy of Michael E. Phelps from Science 211:445, 1981) were produced in a PET scanner. The dark areas are regions of high metabolic activity. 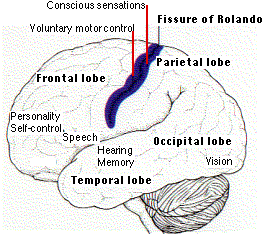 Note how the metabolism of the occipital lobes (arrows) increases when visual stimuli are received. Similarly, sounds increase the rate of deoxyglucose uptake in the speech areas of the temporal lobe. The image on the right (courtesy of Gary H. Duncan from Talbot, J. D., et. al., Science 251: 1355, 1991) shows activation of the cerebral cortex by a hot probe (which the subjects describe as painful) applied to the forearm (which forearm?). Most cancers consume large amounts of glucose (cellular respiration is less efficient than in normal cells so they must rely more on the inefficient process of glycolysis). Therefore PET scanning with 18F-fluorodeoxyglucose is commonly used to monitor both the primary tumor and any metastases. This imaging technique uses powerful magnets to detect magnetic molecules within the body. These can be endogenous molecules or magnetic substances injected into a vein. fMRI exploits the changes in the magnetic properties of hemoglobin as it carries oxygen. Activation of a part of the brain increases oxygen levels there increasing the ratio of oxyhemoglobin to deoxyhemoglobin. The increased demand for neurotransmitters must be met by increased production of ATP. it also increases the blood flow to the area. So there is an increase — not a decrease — in the oxygen supply to the region, which provides the signal detected by fMRI. MEG detects the tiny magnetic fields created as individual neurons "fire" within the brain. It can pinpoint the active region with a millimeter, and can follow the movement of brain activity as it travels from region to region within the brain. MEG is noninvasive requiring only that the subject's head lie within a helmet containing the magnetic sensors.